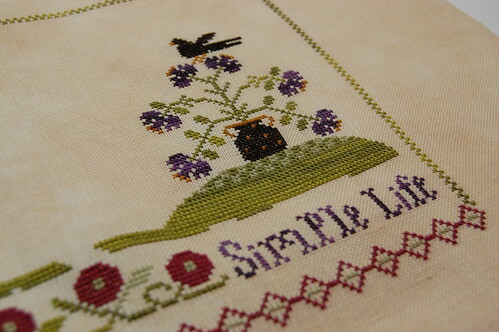 Nicole's Needlework: Long Time No Post! I worked on Shores a lot last week. 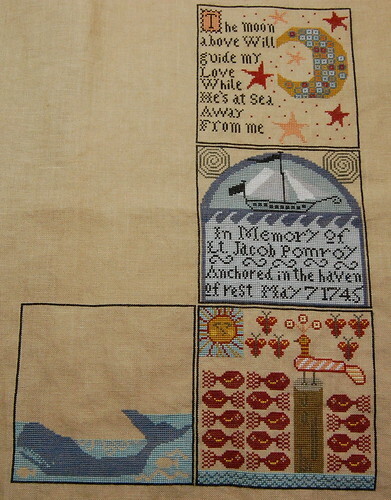 I got the big whale stitched in block 11 and then I worked on the water around the whale. I also got Simple Joys back out. It's coming along, slowly, but surely. 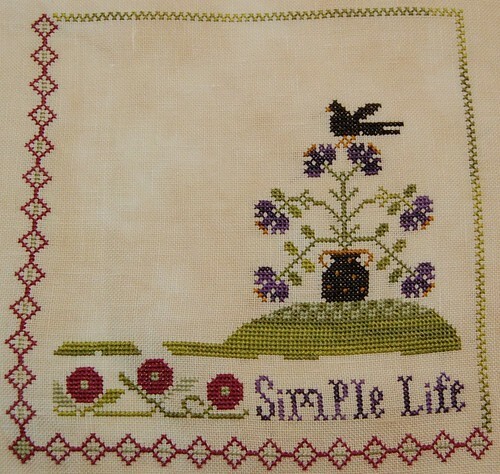 Amy finished her sampler last week. I saw it in person on Saturday - It looks great! Speaking of Amy, while I was there we decided to do a round robin with Karen and Faye. Only instead of stitching it on one piece of fabric we are going to use individual pieces - sort of like our own Fair and Square exchange. We are going to be using designs from The Prairie Schooler Patterns "Friends" and "More Friends." Amy, Faye and Karen chose 32 ct. Vintage Buttercream for their fabric and I chose 32 ct. Vintage Light Examplar for mine. It should be a fun project and it will be nice to have a stitched piece from each of them. Well, the kids are out of school now. Bradley's birthday is tomorrow - he's going to be 10! I just can't believe it. It seems like just yesterday I was holding him in my arms. We're planning on going to Florida soon. They are going to be spending time with my mom while I come back here and relax. I'm sure I won't know what to do with myself!! :) Write soon - hopefully with a finish! Hope you're feeling better now, Nicole! It's not fun to be sick. Love both your WIPs. Simple Joys is so pretty! And a Round Robin -- what fun! Have fun in Florida and sans kids when that time comes! Happy birthday to Bradley! Nicole, nice to see you popping in. I am sorry you haven't been feeling well. Happy birthday to your son. Love the SoHRH and Simple Joy! They are both so pretty. Lovely whale! The rest of the block will go pretty fast now. Lovely progress on your WIPs Nicole! I'm really hankering over Simple Joys, but I'm trying to resist until I've finished a few more things LOL. LOVE Simple Joys. That is going to be my next piece after Virtue Sampler. Hope you are feeling better! I just got over a horrible cold. Being sick is no fun. I hope you feel better now, and your DH too, so you can sleep an undisturbed night again. Your SaHRH whale is great. Looking forward to see the round robin pieces. Sorry to hear you've been sick! I figured something like that must be up, because you usually post pretty regularly. We miss you when you don't! Love your Shores, it's so gorgeous! And Simple Joys is just lovely, you're making great progress! Such a nice design! I'm sorry you have been under the weather..I hate sick! Your Shores and Simple Joys are stunning! Happy birthday to Bradley. Glad you're feeling better. Your "Simple Joys" is looking really nice. That is on my list to stitch, too. It is such a cute design. Great progress on Shores. A big dent in that large block. I love the colors in Simple Joys! I'm sure you will have that done in no time. Nichole, I'm pretty sure you will figure out quickly what to do with yourself but just in case here's some options, read a good book without interruption, use the facility w/o someone knocking on the door needing something. Cooking something you like instead of what someone else would like. Stitching for hours while watching all those movies or shows that aren't for little people viewing. Enjoy! 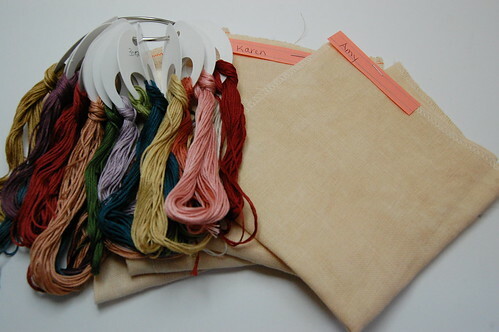 Great stitching, the Round robin sounds like fun. Those threads look just yummy with those fabrics. Your Shores is looking fab, and I agree, Simple Joys is much more colorful that I had imagined. I'll be starting mine next week, as it came yesterday in the mail. Sorry to hear that you weren't feeling well and that Matthew caught whatever it was. It's hard being little and feeling icky. Nice to see you posting again, and your RR sounds lovely. Shores is looking good... WHat a fun idea for a RR. It will be fun to watch all your progresses. Oh, I am sure you will not find it hard at all to keep your self busy while the kids are away :) Think of all the stitching you get done. Sorry to hear you haven't been feeling well Nicole. Hope you're on the road to recovery now. Love your WIPS... that is one big whale. The round robin sounds like lots of fun. Hope you'll share everyone's stitching with us. I see a lot of stitching in your future with the boys being in Florida. Sorry to hear that everyone has been ill! Give your son a big Happy Birthday. Love Shores and watching your progress on it (especially because I haven't stitched mine in months), and love the start on your new piece too! Happy birthday to Bradley for tomorrow - my own DS turned 10 last month. Enjoy your time by yourself - DS is going to Indiana in July to stay with my in-laws, so I'll be in a similar position myself. I've been wondering where you were! Sorry you've been sick. We've had strep here, so I understand. booo. I just got Simple Joys in the mail a few days ago, and I'm so excited to start on it. Your pieces are looking wonderful, as always. You are such a fast stitcher! 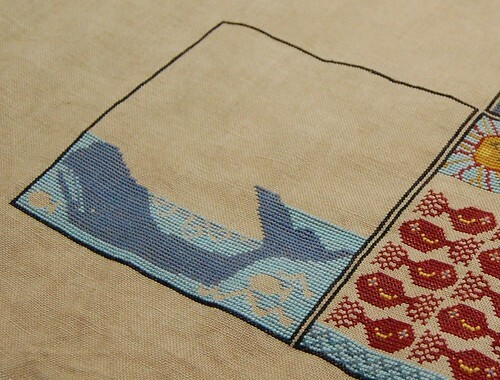 Beautiful stitching, Nicole! Happy birthday to your son. They grow up too quickly!